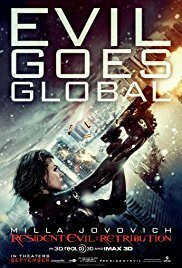 Picking up the action exactly where the fourth movie left it, Alice is captured and taken to a mysterious Umbrella Corporation facility. There, she allies with characters from the previous movies and rages war against the corporation. I’m guessing that those who watched the saga until the fifth movie are not watching it for the plot but indeed for the awesome action scene and the hot chicks…and it is certainly not this movie that will disappoint them! It is as if Anderson basically decided to give up the idea of a scenario, which is here just an unbelievably ridiculous pretext for all the action scenes, and decided to base everything on the breathtaking action instead. For me, this works ok, the movie is visually impeccable, probably some of the best CGI ever seen. The soundtrack is just mind-blowing! The use of dubstep music for horror/action is increasingly popular these days, and works perfectly with this movie. Sometimes there is nothing happening and the music just pop out loud and gets you all excited! In the vein of Sucker Punch, this is definitely a movie that should divide horror fans.